The West Virginia Power will host a Vs. Cancer night on Saturday June 10. West Virginia plays the Greensboro Grasshoppers at 6:05 P.M. and will raise money for the Vs. Cancer Pediatric Brain Tumor Foundation. Vs. Cancer is an organization that donates money to pediatric cancer research. 50 percent of all donations fund local pediatric cancer programs and the other 50 percent funds pediatric brain tumor research. Each day 250 children in the United States lose their lives to cancer and 13 children are diagnosed with brain tumors. "We're glad to be assisting in such a worthy cause," Executive Vice President Ken Fogel said, "I hope that whatever small part we play helps them reach their goals." The Power have set a goal of $8,000 with a deadline on June 10. 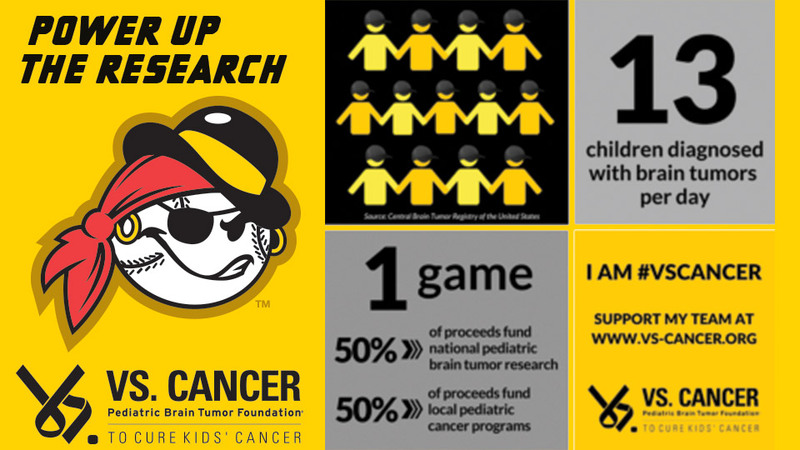 The Minor League Baseball campaign, which the Power are a part of, have a $45,000 total goal. If the Power reach their goal, members of the front office staff will shave their heads. "This is a great charity that will help a lot of kids in the greater Charleston area, as well as fund national research," Garrett Weller, The West Virginia Power Production Manager said, "I've never had my head shaved before, but I'm excited for us to meet our goal and would be honored to do it for the kids." You can help the Power and Minor League Baseball reach their goals by joining the West Virginia's team at Power Vs. Cancer.